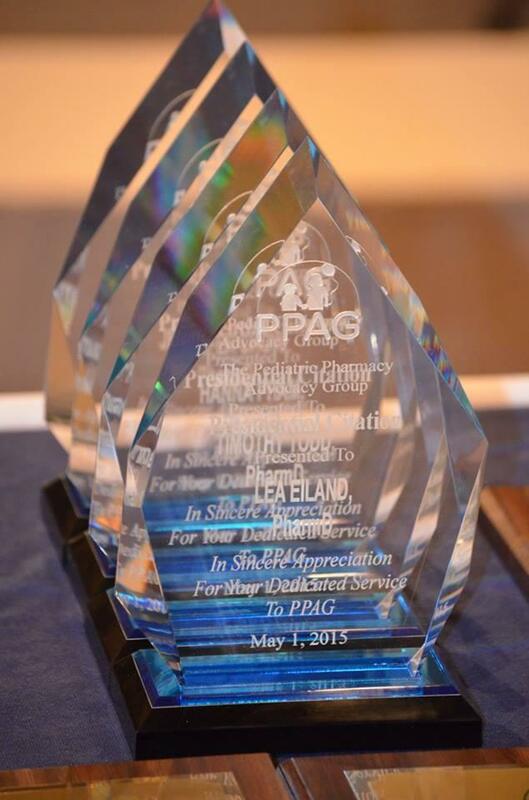 The Spirit of PPAG Award recognizes outstanding member contributions to the Association. The recipients of this Award embody and exemplify the values of PPAG and inspire action in others. The Award recognizes those "behind the scene" contributors that usually go unnoticed but are not less important. Recipients are nominated by Committee Chairs and the Executive Committee makes final recommendations to the PPAG President. Recipients are officially recognized at the "Town Hall Business Meeting" during the PPAG Annual Meeting each year. Bernard Lee, PharmD, Pediatric Clinical Pharmacist at the Mayo Clinic in Rochester, MN, for his contributions to the Membership Committee. Peter Johnson, PharmD, Assistant Professor of Pharmacy at the University of Oklahoma in Oklahoma City, OK, for his contributions to the Advocacy Committee. Dr. Cindy Dusik, 2008 Chair of the Board, presented the Awards. Jill Thompson, PharmD, Clinical Specialist at MUSC, for her contributions as Manuscript Editor of the Journal of Pediatric Pharmacology and Therapeutics. Sandra Benavides, PharmD, Assistant Professor, Nova Southeastern University, for her contributions to the Research Committee in establishing the neonatal grant application process. These awards were presented by Dr. Jeff Low, 2009 Chair of the Board. Jeff Cies, PharmD, Pharmacy Clinical Coordinator, for his contributions to the Education Committee. Catherine Tom-Revzon, PharmD, for her contributions to the Advocacy Committee and PPAG's KidsMeds (www.kidsmeds.info) website. These awards were presented by Dr. Michael Christensen, 2010-12 Chair of the Board. Hanna Phan, PharmD for her contributions to the Membership Committee and the development of Recognized PPAG Student Groups. Ashley Crumby, PharmD, for her contributions to the Education Committee coordinating hospital tours of Riley Children's Hospital. Kristen Nichols, PharmD, for her contributions to the Education Committee coordinating hospital tours of Riley Children's Hospital. Maria Whitmore, PharmD, for her contributions to the Education Committee coordinating hospital tours of Peyton Manning Children's Hospital at St. Vincent. Kalen Manasco, PharmD, for her contributions to the Education and Research Committees developing and delivering a research workshop at the 2013 Pediatric Pharmacy Conference. Kathy Pham, PharmD, for her contributions to the Advocacy Committee representing PPAG and the pediatric pharmacy profession during FDA workshops about Drug Shortages. Edress Darsey, PharmD, for her efforts to create and Chair the new Pediatric Drug Development Committee. ​Mary Riedy, PharmD, for her contributions to developing the PPAG Student Council. Charla Miller, PharmD, for her contributions as the official photographer of PPAG. Amy Holmes, PharmD, for her contributions to the advocacy efforts of PPAG.